This is not about a class. It's not about a bike. It's about YOU. Master Instructor AKIN shares what FIND IT! means to him. You’re a teacher, you’re a coach and you’re an athlete. What makes your class unique? My main priority is coaching, specifically athletic coaching. As your coach, I start by focusing on your technique and form. I’ll teach you the fundamentals and build up your foundation, turning you into a good rider before I let you try the more advanced moves and start to go crazy on the bike! To me, that’s what coaching is about — the ability to train someone to become so aware of their own body that with time and dedication, they know what’s working and what isn’t for them. There are stages of progressions in my classes, and as I build up the moves and make it harder, it will eventually become second nature to you. My coaching will build you up both mentally and physically. So there’s a mental component, too? Definitely! What I do is mental, spiritual and soulful. It’s a combination of everything. I want you to be able to take what you learn in class and apply these skills to the rest of your life. The goal is to succeed anywhere, both inside and outside of the studio walls. What you experience and learn within the SoulCycle walls, you can apply to your outside life. Tell me about this. This is something I tell everyone. I used to be a tennis player and my coach would consistently have new drills. He had a master plan and a strategy in place. He would make me do his drills every single day and it focused on both my strengths and my weaknesses. He knew the specific areas I needed to work on and would make me practice them over and over so that when it was time to compete, I wouldn’t even think about them anymore! Because of all that practice, it’s second nature to me! I apply this same strategy to all of my classes and for my riders. I build up the repetition and your foundation so it becomes second nature to you. You don’t even have to think about it, you just… do it. Whatever may seem impossible at that moment, you learn you can tackle because we’ve build on your mindset. This carries you throughout everything you do and you can take it with you outside of the studio. When you go for that interview, you’re going to kill it! Being timid or feeling uncertain doesn’t scare you anymore because I’ve trained your mind to overcome these thoughts. I want you to believe in yourself — over and over and over again. To me, a breakthrough is exactly that — being able to control what seems uncontrollable! It can happen in the room while you’re riding and it can happen outside of the studio. A breakthrough is going through the steps, building that acute awareness, incorporating it into your life and creating a new lifestyle! All the struggle, all the fight and all the hard work you put in will end up preparing you for something greater. For example, you finally get the pace in class. Now you’re involving your upper body and you actually understand what I am asking you to feel. That’s a breakthrough! Maybe you held a long-distance run on the bike longer than you thought you could and it finally clicked in your head that “I can do this. I know what I need to do to get there.” That’s a breakthrough. It’s this sense of confidence that you can take with you outside of class and into your life. It’s a mindset shift that can create a new lifestyle. There’s something magical that happens inside that room. People have a really hard time putting it into words — but it extends beyond the studio walls. 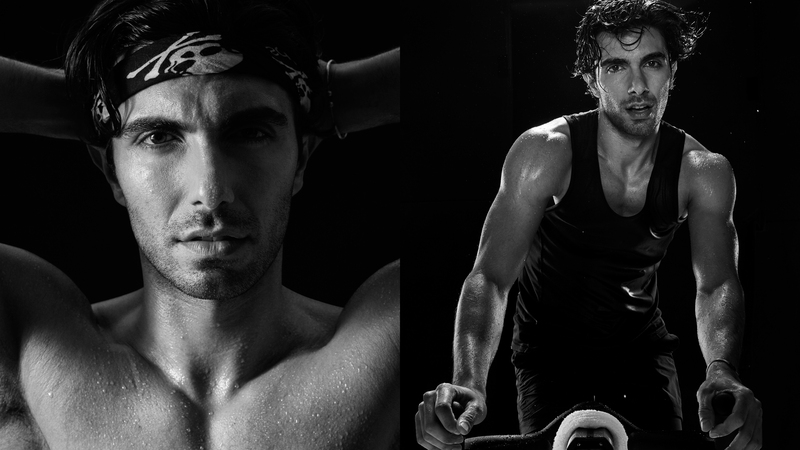 What happens inside the SoulCycle studio? Everything is interconnected. People can find community, they can find friendship and an army. They can find confidence. They can find what they are in their core. They can find out who they really are deep inside. They can figure out what their dreams are and what they are genuinely passionate about. They can find their confidence and strength. They rediscover their value and worth. Everything you can find is already IN you — I’m just there to help you bring it out! What do you think your riders take away from your class? Everything I do is in my riders' best interests. My goal is to help them grow mentally, physically and spiritually. For those who stick with me and really listen to what I'm saying, that's when I start to see my riders succeed. The moment you begin to grow is when you finally let go of all your excuses and realize that I am your coach! I understand your needs and will do whatever it takes to help you get there. I have personally witnessed a shift in my riders who are open to the process. I have watched them grow, achieve their goal, set new ones… and crush them! Let’s take it to the next level! That’s what I instill in you. Constant progress is what keeps people excited and coming back. I won’t ever let you get stuck. That’s a promise. Catch classes with AKIN! Want to ride? Click HERE to grab a series and book a bike!